Nativa en Colombia; Alt. 0 - 500 m.; Amazonia, Llanura del Caribe, Orinoquia. Annual. Culms geniculately ascending, or decumbent; 100-200 cm long. Culm-nodes glabrous. Leaf-sheaths glabrous on surface. Ligule a ciliate membrane; 2 mm long. Leaf-blades 12-50 cm long; 3-12(-20) mm wide. Leaf-blade midrib conspicuous. Leaf-blade surface glabrous, or puberulous; hairy adaxially. Leaf-blade margins scabrous. Inflorescence a panicle; terminal and axillary; embraced at base by subtending leaf. Panicle open; ovate; 12-40 cm long. Primary panicle branches ascending. Panicle axis smooth, or scabrous. Panicle branches stiff. Spikelets appressed; solitary. Fertile spikelets pedicelled. Glumes reaching apex of florets; thinner than fertile lemma. Lower glume ovate; 0.2-0.25 length of spikelet; membranous; without keels; 5 -veined. Lower glume apex truncate, or obtuse. Upper glume ovate; 1 length of spikelet; membranous; without keels; 7 -veined. Upper glume apex acute. Basal sterile florets barren; without significant palea. Lemma of lower sterile floret similar to upper glume; ovate; 1 length of spikelet; membranous; 7 -veined; acute. Fertile lemma elliptic; dorsally compressed; 2.4-3 mm long; indurate; shiny; without keel. Lemma margins involute. Lemma apex acute. Palea involute; indurate. Europe: southwestern and southeastern. Asia-temperate: Caucasus, China, and eastern Asia. Australasia: New Zealand. North America: eastern Canada, northwest USA, north-central USA, northeast USA, southwest USA, south-central USA, southeast USA, and Mexico. South America: Mesoamericana, Caribbean, northern South America, western South America, Brazil, and southern South America. 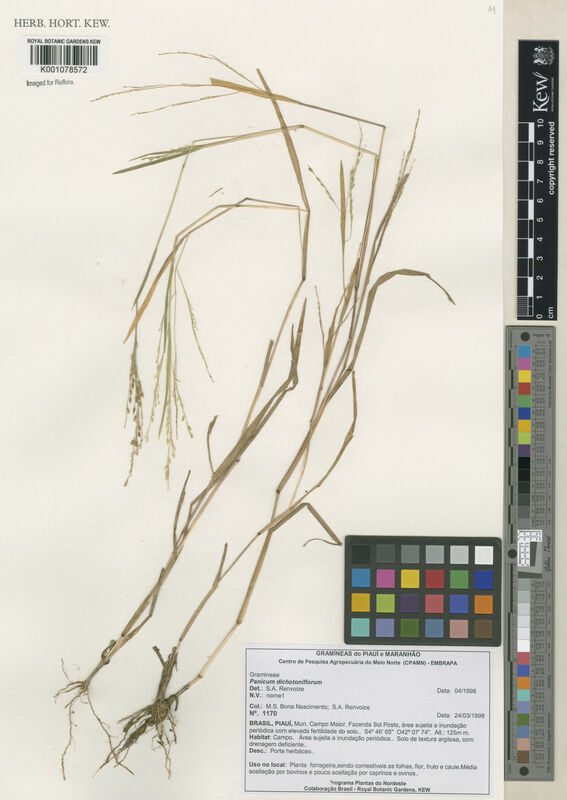 Panicum brachiatum Bosc ex Spreng. Panicum chloroticum Nees ex Trin. 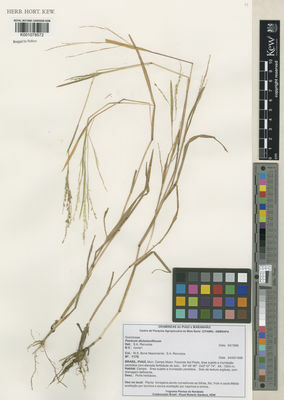 Panicum hygrophilum Salzm. ex Steud. Panicum proliferum var. chloroticum (Nees ex Trin.) Hack. Panicum proliferum var. pilosum Griseb. Panicum proliferum var. strictum Griseb. Panicum retrofractum Delile ex Desv. Barina, Z., Rakaj, m. & Pifkó, D. (2013). Contributions to the flora of Albania, 4 Willdenowia 43: 165-184. Sukhorukov, A.P. (2011). New invasive alien plant species in the forest-steppe and northern steppe subzones of European Russia Feddes Repertorium 122: 287-304.